Barcelona manager Ernesto Valverde believes the women’s game has developed to a stage where a female manager would be capable of coaching the Camp Nou side in the near future. 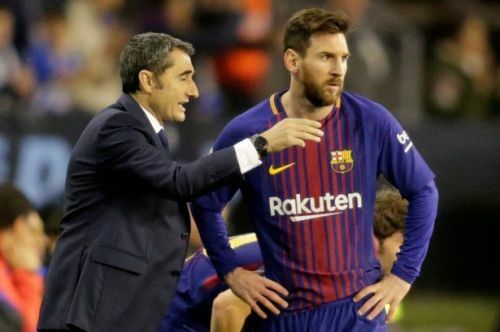 Valverde is in his second year at Barcelona, having joined from Athletic Bilbao as a replacement for Luis Enrique. The 55-year-old has had a great impact at the club so far, although he has had his fair share of criticism from a section of Barca fans. He led Barca to the league and the Copa del Rey in his debut season, and the club is still in the hunt for the treble this season. The Blaugrana hold a 10-point advantage at the top of LaLiga and are also in the final of the cup, having beaten rivals Real Madrid in the semi-final. Barca are also in the run for the Champions League, with the club set to welcome Lyon in midweek, following a goalless draw with the French side in the first-leg of the last 16 tie. Speaking at a programme on International Women’s Day, marked annually on March 8, Valverde said he is impressed with the development of the women’s game. According to him, the growing presence of females in football means a woman would be capable of taking charge of Barcelona in the near future. "The truth is that the football world is taking big steps forward in recent times. "It's unstoppable that women are going to have more presence. "Women's football is making tremendous progress and there are clear examples of what it is achieving. "In men's football too there is more of a female presence and this will keep advancing further. "In time, there could be a woman managing Barca." Valverde and Barcelona will be welcoming Rayo Vallecano to the Camp Nou on Saturday, as they look to extend their lead on top of LaLiga.